Strength and Organisation of the Italian Army and Air Force (Regia Aeronautica) in 1942. Italian infantry in the Western Desert in 1942. All Italian citizens from the ages of 18 to 54 years were liable for military service. The first stage was that of conscript service where the recruit served 18 months with the colours, followed by post-military training which ran from the completion of service until the 33rd birthday. After that date the citizen went into the reserve and could be liable to call-up in time of war until the age of 54. Until 1943 Italy did not suffer from a shortage of man-power; the problem lay in training and equipping her soldiers. In Libya, eight infantry divisions were destroyed and 130,000 men taken prisoner in Wavell’s offensive at the end of 1940 and the beginning of 1941. During the course of the war 20 new divisions were raised but they could not replace the massive losses suffered by the Italian Army. Mussolini’s ‘crusade against Bolshevism’ since the beginning of Operation Barbarossa cost Italy dear; of the 229,000 despatched to the Eastern Front over half became casualties. In Africa as a whole, 27 divisions were destroyed between December 1940 and May 1943. Another 36 divisions were immobilized outside Italy, occupying France or suppressing partisans activities in the Balkans. A number of divisions were undergoing retraining and there were only 20 divisions to face the Allied invasion of 1943. 31 divisions in Croatia, in the Balkans, on Crete and other Greek islands. While the division was the basic formation in the Italian Army a number of troops were organised at corps or army level essentially to act as higher formation reserve units. The Italian infantry division was known as a ‘binary’ division (divisione binaria) because it was based around two infantry regiments. From 1 March 1940 an MVSN Legion (Blackshirts) of two battalions was attached to most of the divisions, partly to increase the manpower of the division but also to include fascist troops within regular army formations. During 1942 attempts were made to increase fire-power and mechanisation within the Army. Additional a new, more flexible organizational structure was introduced. Machine guns 276 (60 heavy) 216 (54 heavy, 162 light) 216 (72 heavy, 144 light) ? Total men 7,739 ? ? Anti-tank guns 16 (47mm) 24 (21 x 47/32 self-propelled guns, 3 x 47mm towed) ? Anti-aircraft guns 8 26 (20mm) ? The Alpine, Paratroop and Bersaglieri regiments were often of the highest quality but most of the infantry formations were poorly equipped, and badly supplied. The Italians tended to subordinate the infantry to other arms; and Italian soldiers were never convinced of the necessity or righteousness of their involvement in the war. Italian military doctrine stressed the primacy of the offensive, the defensive being considered as a temporary expedient prior to launching a rapid counter-offensive. In reality, however, Italian attacks were seldom pressed home with much conviction: in 1940 the Greek Army considered that Italian assaults would grind to a halt if contained for only 20 minutes. Despite popular myth the Italian soldier did not lack bravery, what he lacked were the arms and equipment necessary for modern warfare. Up-gunning an Macchi MC200 Saetta fighter. It had an engine of low power and the performance was correspondingly modest. Moreover it never had anything that other air forces would have regarded as proper armament. Yet in combat with the lumbering Hawker Hurricane it proved effectiv. From late 1940 until Italy’s surrender in September 1943 the Macchi MC200 Saetta saw more combat than any other Italian type – and it was build about December 1944 ! An expeditionary force (Comando Aviazione des Corpo de Spedizione Italiano with three groups and approx. 100 planes) was sent against the Soviet Union in the August of 1941 as part of the Crusade against Bolshevism; the net result of which was to stretch Italian resources and to deny desperately needed aircraft to the Mediterranean Fronts. In the Mediterranean the Air Force was engaged in the aerial assault on Malta and in supporting the Army in Libya. The failure to knock out Malta and prevent British convoys from traversing the Mediterranean made possible the build-up of British forces in North Africa and ultimately ensured the defeat of the out-numbered Axis forces in the autumn of 1942. Mounting aircraft losses during 1941 and 1942 were not met by increased aircraft production, and Germany eventually took over the brunt of the aerial war in North Africa, the Italian Air Force concentrating on reconnaissance and supply duties as well as the defence of the homeland from the increasing attacks of Allied bomber forces. The collapse of the Axis forces in North Africa in May 1943 and the massive build-up of Allied aircraft put the Italian Air Force on the defensive. Despite valiant efforts the Air Force was unable to stem the tide of Allied material supremacy. On 8 September, with the signing of the armistice, the Regia Aeronautica was no more. The Italian Air Force had begun the war with nearly 2,000 operational aircraft ready for combat and with almost the same number in reserve. By the September of 1943 the Air Force numbered 1,200 aircraft of which about half were serviceable. The basic tactical unit was the squadron (squadriglia) which had a strength of around nine aircraft with another three in reserve, although bomber squadrons usually had only six front-line planes. Two or three squadrons formed an air group (gruppo) and two or more groups would form a wing or stormo, the basic tactical formation within the Air Force. Two or three wings would on occasion combine to form an air brigade which in turn with another brigade would form an air division. The largest formation in the Air Force was the air fleet which consisted of two or more homogeneous fighter or bomber air divisions. The heavy losses incurred by the British offensive in January-February 1941 entailed a full-scale reinforcement of the Italian Air Force in North Africa. 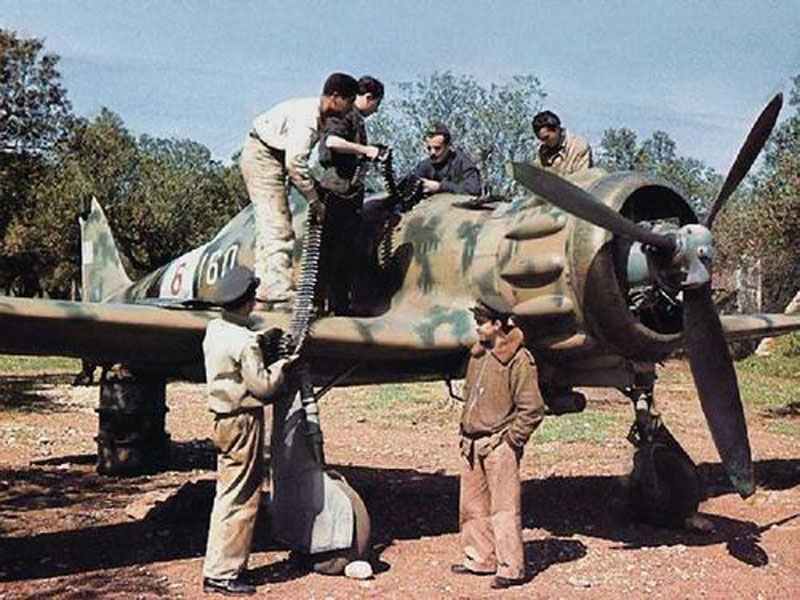 The shortage of spare parts and aviation fuel severely reduced the efficiency of the Italian Air Force in North Africa which by early 1942 had, in effect, become sub-ordinate to the Luftwaffe. Units of Italian aircraft remained also in Greece until 1943 with the responsibility of attacking Allied shipping in the Aegean and eastern Mediterranean. Although there had been occasional bombing raids on Italy by RAF Bomber Command, it was only in 1942, with the development of the successful long-range four-engined bomber, that the industrial centres of northern Italy came under any sustained attack from aircraft based in England. Three groups of night-fighters were formed and a number of radar-equipped Me 110 and Do 217J aircraft were supplied from Germany but without a proper ground control system, an effective defence proved impossible. Fortunately for Italy, the main brunt of the Allied strategic air offensive was directed against Germany.